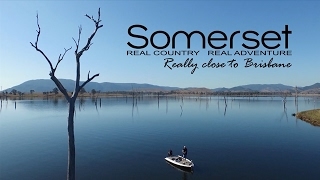 Kilcoy is an idyllic country town located along the D'Aguilar Highway, surrounded by a scenic landscape, of rolling hills and rugged mountain ranges with views over the northern reaches of Lake Somerset. Only an hour from Brisbane, Kilcoy's country charm, with enchanting shops, landscaped parks and friendly residents is the place to visit to escape the hustle and bustle of city life. Looking to keep busy during your visit to Kilcoy? Visit one of three wineries, go boating or fishing at Lake Somerset, wander around Yowie Park or visit the environmental interpretive display at the Kilcoy Information Centre. Kilcoy has a number of accommodation styles in the area ranging from free overnight caravanning spots, bush camping experiences, to hotels, motels, farm stays and lodges, so there are plenty of options to cater for any budget if you are looking to stay a while. Kilcoy was accredited as an RV friendly town in 2014. Here you will find three designated caravan rest areas including the Kilcoy showgrounds, Anzac Park and Seib Street. The Kilcoy Showgrounds has powered sites and amenities for a small fee. The dump point is also located at the showgrounds. Situated alongside Kilcoy creek, Anzac park is free for 20 hours with amenities and is walking distance to Kilcoy's eateries and town centre. The Seib street rest area is available as a 20 hour stop over for self contained vehicles and is located adjacent to Yowie Park. When staying at the rest areas, please be respectful of the community and other travellers by minimising noise and cleaning up after yourself before you leave. If you are visiting Kilcoy you can't miss the yowie. The yowie legend dates back generations, including early Aboriginal accounts. With the most famous yowie encounter occurring at Sandy Creek in 1979. Yowie Park pays homage to the yowie legend with a statue of this mythical creature. It's a great place to have your photo taken!